The Autoscan DS-EX offers unprecedented dental scanning technology in terms of both accuracy and efficiency. 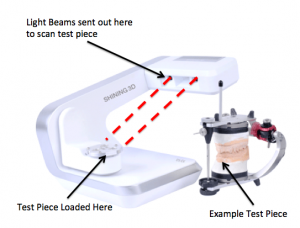 This desktop sized 3D dental scanner (pictured above) uses the latest in 3D structured light technology and allows the user to simultaneously scan up to 8 dies, without the loss of accuracy or detail. The software also offers the capability to scan various impression modes, with increased post-processing capability with continuous scanning. A full list of specifications can be found at http://en.shining3d.com/digitizer_detail-4492.html . In short, this small piece of kit has incredible potential in a number of applications, due to its size, ease of use and the quality of data that is produced. It is also compatible with most of the main CAD/CAM software used in the industry and also supports scanning of most 3D articulators on the market, thanks to the fully open software. Autoscan DS-EX has real potential for both professional (dental clinics) and educational (colleges) development.